The Automation Networks ANC-800e EtherCAT Gateway allows information to be transferred seamlessly between EtherCAT and RS-485 networks with minimal configuration requirements. 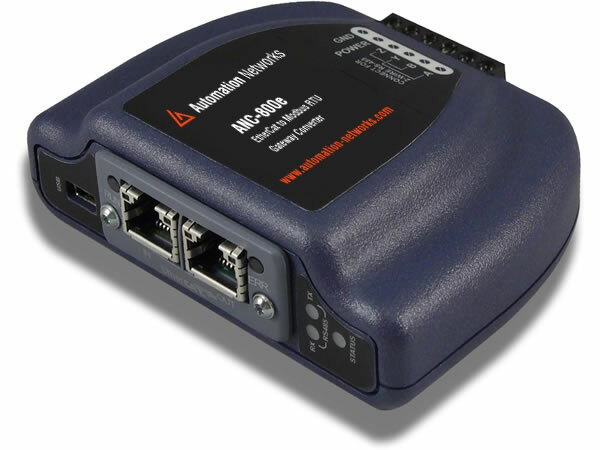 The ANC-800e provides two IEEE 802.3 100BaseT Ethernet ports and an RS-485 port (4-wire terminal block style). The ANC-800e can be configured for a simple low cost line structure, a tree structure, daisy chaining, or drop lines. The RS-485 port supports multiple protocols. PLC-style logical, arithmetic and filtering database manipulation operations allow the construction of complex autonomous data conditioning functions. The ANC-800e is a part of the ANC Gateway Series product family. ANC Gateway is designed to provide a uniform interface, configuration and application experience. This commonality reduces the user’s learning curve, reducing commissioning time while simplifying support. RS485 Serial Protocols: The ANC-800e Gateway has the flexibility to choose Modbus Master/Slave as well as other RS485 serial protocols which include: Modbus Sniffer, A.O. Smith AIN, A.O. Smith PDNP, BACnet MS/TP Client, BACnet MS/TP Server, TCS Basys Master, MSA Chillgard Monitor, DMX 512-Master, DMX-512 Slave, M-Bus Master, Metasys N2 Master, Metasys N2 Slave, Siemens FLN Master, Siemens FLN Slave, Sullair Master, Toshiba ASD Master, Toshiba PLC Master.